More and more couples are choosing adults-only all-inclusive honeymoon resorts because they really don't want kids to be part of the experience. While many of the best honeymoon destinations also serve as hot spots for family vacations. This means that you could encounter a storm of children in the restaurants, swimming pools and fitness centers provided to all guests at your chosen resort. You can reduce your odds of this happening by traveling in the off-season, but you’re still likely to encounter some children while some of the attractions may not be open. This may lead you to pick an adult-only resort. This allows you to travel in peak season without concern for young children peeking around the corner while you steal a kiss or the teenagers loudly intruding on a romantic moment. If the resort is also all-inclusive, you can pay one price in advance to cover most of your trip expenses. That removes financial weight from your shoulders, freeing you to thoroughly enjoy every moment of your honeymoon. There are a growing number of adult-only resorts that now off all-inclusive packages. To give you an idea of what you might expect, consider this short list that includes some of the best options. Secrets The Vine Cancun: Secrets is one of the most prominent all-inclusive resorts, and this is one of the many properties that are also open to only adults. You’ll find some of the most affordable prices at these resorts plus a long list of fun amenities. The Vine in Cancun has four swimming pools, seven bars, 10 restaurants, and nearly 500 rooms. Bahia Principe Ambar Blue: You’ll find this luxury resort sitting directly on Bavaro Beach in Punta Cana. The property includes six restaurants, all offering buffets or a la carte menus that are included in the price of your room reservation. You’ll also have access to four bars, three swimming pools, and the beach. There is always the option of paying extra for more luxurious services, like a personal butler or upscale dining in the resort’s seventh restaurant. Ambar Green is another Bahia Principe resort in Punta Cana that offers all-inclusive packages for adults. Breathless Resorts: This is another adults-only resort chain similar to Secrets. Breathless caters to young adults who want to have fun, so you’ll find that these resorts offer more options for nightlife than you’ll find with many other resorts. They have all-inclusive resorts in Jamaica, Mexico, and the Dominican Republic. These are smaller resorts that have fewer than 200 rooms, so you’ll have more privacy but may need to reserve early so that they aren’t booked during your trip dates. 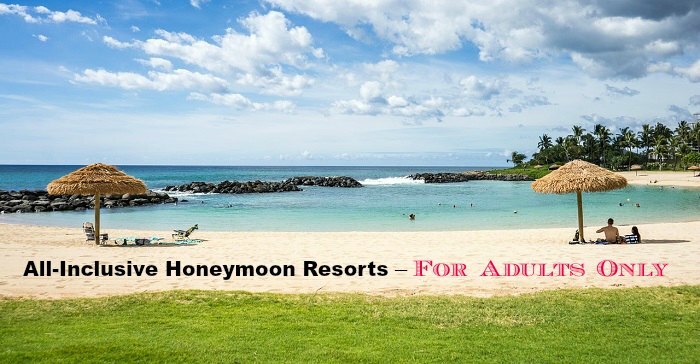 Before you book an all-inclusive honeymoon package determine exactly what is and isn’t included. Many packages still require you to pay for alcoholic beverages while others limit what items you can order off the menu, what restaurants you can visit, or the hours during which you must eat. Sometimes gratuities are included, but other times you need to leave them in cash. If you can’t get a complete list of what is included online, call the resort before booking. If you call and tell them that you’re planning a honeymoon, they may give you a room upgrade or other surprises.